The FOCUS platform for advanced metering and smart grid applications is designed to enhance your sensor ecosystem with industry-leading reliability and innovative features. Expanding on Landis+Gyr’s proven and industry leading AX solution, the FOCUS AXe-SD provides enhanced security with tamper detection features, more power and memory and reliable functionality for the utmost in performance today—and the future. With capabilities like dual-demand, recorder, and reactive, the FOCUS AX metering platform (including the FOCUS AXe, AXRe, and RXRe meters) can accommodate next generation applications* (pre-pay, power quality, tamper detection, etc.) to enhance the value of your meter sensor ecosystem. 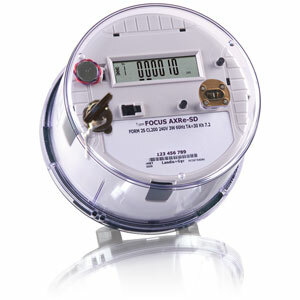 The E351 incorporates a 200A, motor driven, cam action disconnect/connect switch under the meter cover. This advanced, market-leading switch, coupled with the field-proven reliability of the E351, delivers Landis+Gyr’s third generation design answer to today’s evolving utility requirements. *Select features rely on a communications module. Meters that are AMI-enabled with communications are clearly labeled on meter face above digital display.